Melissa Sharp, the wife of "Adam God," who started the riot December 8, 1908, that resulted in the death of two officers, two members of the "Adam God" flock and a private citizen, as well as injury to others, slept in freedom last night. For the first time in nearly eleven months this woman yesterday walked in the open and free air; enjoyed the liberty of persons not guilty of crime, and was entitled to do as she chose. With this liberty, thrust upon her suddenly yesterday morning when the prosecutor's office decided that there was no charge upon which she could be held, Mrs. Sharp was almost as helpless as she had been when confined by prison walls, and when asked the simple question as to what she intended to do said she didn't know. She had no notion, no plan. "All I want is rest," she said. "I want to be able to sit down or to lie down and solve this tremendous problem. I want my boy, my 16-year-old son, who is far away. Maybe when I get him I can think of something to do." When Mrs. Sharp was released from the county jail yesterday morning she did not know which way to turn. She had relatives in Southern Missouri, but she cared not to ask them for aid. Then it was that Mrs. Margaret Simmons, matron of the jail, came to her rescue. "You come home with me," said Mrs. Simmons. "Come home with me and stay there until you can decide what to do." And Mrs. Sharp went home with her. Immediately after the "Adam God" riot the woman was placed in jail. She was transferred from the city holdover to the county jail. Ever since she has remained in prison without trial. What her fate would be she never knew and as the months dragged along she didn't care. "She was a model prisoner," said Mrs. Simmons. "I don't believe that her mind was unbalanced and regardless of what some people may think I decided to take her into my own home. It is an act of charity and I can conceive of no greater charity than the sheltering of this lonely, lonesome woman." Mrs. Sharp is 38 years old and she appears to be younger. Her husband is 54 and he is now serving a sentence of twenty-five years in the Missouri penitentiary. While Mrs. Sharp wants to be faithful to him, she doesn't care to discuss the fate of her husband or her relations with him. She has a son and her whole life now is centered in that boy, who, despite his years, is doing a man's work on a railroad in Montana in an effort to earn his own living. James Sharp, who is the "Adam God," was not alone old, but he was ugly and repulsive. He was many years older than his wife and why she married him only she herself knows and she won't tell why. She was the pretty daughter of a farmer, living in Mountain Grove, Mo., and Sharp was working on a neighboring farm. It was after their marriage that the religious frenzy got possession of them. they were not converted by the words of a man. They got the idea of fanatical religion and they got it together. "I can't explain how I began to believe in the strange creed," said Mrs. Sharp. "It just came on me, and it came on him. I am through with that creed now. I still have the faith. I believe in God' I believe in the Bible. What I want to do now is to go into some church; to hear the reading of the Bible; to listen to the instruction of some good minister. I am through with the other form." When Mrs. Sharp left the jail she expressed no thought of her son. It was when she reached the home of Mrs. Simmons that the mother love pronounced itself. When the woman entered the matron's home on Troost avenue she little realized the character of the friend who had taken her to her own abode to afford her shelter. Mrs. Simmons's son was at home and when he started to leave it he put his arms affectionately around his mother and kissed her. Mrs. Sharp began to weep. The sign of affection between Mrs. Simmons and her son had awakened her to new ideas. CRIED AT THOUGHT OF SON. "O, if I only had my boy," she said. "That's what you want to do," said the matron. "Get your own boy. Let him be with you; let him solace you; let him live for you and you live for him." This simple statement from a simple woman of culture, the widow of Major Simmons, a confederate officer, a former newspaper man of Kansas City and one of the most revered of the town's early-day inhabitants, afforded consolation to the distressed woman. "I shall send for my boy," she said. "He must come to me. I'll try to forget this terrible ordeal through which I've passed. I'll live for that boy." The woman dried the tears in her eyes and seemed comforted. In the afternoon she took a long walk along Troost avenue, the first walk in the outdoors in nearly a year. She looked at the people and studied them. She came back to Mrs. Simmons refreshed. She still seemed a bit worried, but she appeared as one who expected happiness. She retired about 9 o'clock after bidding Mrs. Simmons goodby for the night. "I'm tired," she said, "but I feel so much better. I think I can sleep now." A father's eloquent pleading and an aunt's tears availed nothing yesterday morning when Thaddeus S. Wilson was arraigned before John M. Nuckols, United States commissioner on the charge of sending letters with fraudulent intent to R. A. Long and Lawrence M. Jones, and he was bound over to the United States district court which meets tomorrow. In default of the $2,000 bond Wilson was sent to the county jail. "I knew my boy never meant anything wrong," said the Rev. W. E. Wilson, the father of the young man, who arrived yesterday from Earlton, Kas. "He simply wanted to borrow the money to pay me back the debts he has incurred during the past years. If he has violated any law, I'm willing to have him punished, but I can't see where it is. He has the best reputation in our part of the country, and I can't see where any harm was done." According to the father, the young man's past had not always been a rosy one. He had become extravagant and had invested his savings in mining stock which never amounted to anything. He had been successful as a school teacher, the father said. "I can get him here to trial. He won't have to stay in jail, will he?" "I'll have that disagreeable duty to perform if the bond is not furnished," was the commissioner's response. Prisoners at the county jail are having a pretty hard time just now getting something to read, and County Marshal Joel Mayes asks for magazines and periodicals. The magazines which the jail now affords have been read and reread so many times that some of the prisoners can almost repeat the stories and poems by heart while some of them have even digested the advertising portion to the extent of memorizing it, so anxious are they to read. The marshal says a great many of the stores have magazines which they cannot return and he would be very glad to get these for the prisoners and, in fact, would be greatly appreciated reading matter from any source. Nearly as many visitors applied at the county jail for admittance to see a friend or relative yesterday afternoon as there are prisoners in the jail. Approximately 100 visitors were at the jail during the hours allowed for visiting yesterday afternoon. There are only 125 prisoners. Visiting hours are between 10 to 12 o'clock and 2 to 4 o'clock every day except Saturday when visitors are not allowed. That day is given over to a general house cleaning. On Sunday morning the visiting hours are usually occupied by church workers who hold services in the jail. After more than a dozen years on the police department, William Long, the jailer at police headquarters, resigned yesterday to take a position at the Hotel Baltimore as night house officer. He will serve under H. W. Hammil, former lieutenant in the police department, who resigned to go with the hotel about three months ago. Long was sent to the "woods" with others who thought that Hayes should have been retained as chief. He was moved back to headquarters five months ago. ROSE JUST HAD TO STEAL. Stealing hacks isn't the only accomplishment that Rose smith possesses. She was arrested yesterday afternoon in Rosedale for climbing on Thomas Murphy's hack and driving away without the owner. But her performance was placed in the background when she attempted to carry away all the electric light fixtures in the women's holdover at headquarters by concealing them in her stockings. The woman was suspected when Charles Gatto and Robert Wiseman, the two jailers, entered the holdover yesterday morning. Neither could explain the disappearance of the electric globes. It remained for Lieutenant Harry Stege, the Bertillon expert, to solve the disappearance. When "mugging" the woman he imagined he heard a rattle of glass, and to his astonishment, Rose extracted the missing globes from her stocking. "I just wanted to steal something," she said, with a grin. James Sharp, the religious fanatic on trial for murder, spent a quiet day yesterday in the county jail. Most of the day Sharp was in his cell reading the Bible and praying. As on previous Sundays, Sharp did not take part in the religious services held in the jail building. He was not visited by anyone, and the jailers did not allow him to visit his wife. In the federal court yesterday Charles L. King was sentenced to two years in the Leavenworth prison and fined $100 and costs for counterfeiting. 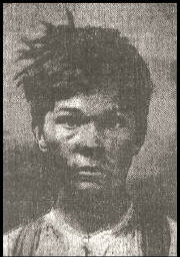 Mary Cook, his accomplice, was fined $100 and sentenced to the Jackson county jail for four months. Herbert H . Ready and A. F. Brooker were fined $100 and costs each on charges of using the mails to defraud, and Harry J. Egan was fined $50 and costs on a similar charge. Sam Nigro was fined $10 and costs for retailing liquor without a license. The case against his wife was dismissed.